Elvis Munis, riding from Chile to Kili, is in the U.S.
Meet Elvis Munis—he’s cycling around the world, unsupported, for two years to raise funds for education for fellow Tanzanian students in wildlife conservation. In July, Elvis crossed into the U.S. from Mexico, and he's in Tucson, Arizona, right now giving presentations and talking to organizations about support for his cause. He'll be heading to the west coast in August, before heading north to Alaska and west to Russia and beyond. Chile to Kili was conceived by the 25-year old Tanzanian student and naturalist after he identified one of the major conservation problems in his country: the lack of opportunity for Tanzanians to obtain the education necessary to manage their own natural resources. The goal is to raise $100,000 as Elvis rides around thewold over the next two years – enough money for ten one-year conservation scholarships, and to support education at the Conservation Resource Centre (CRC). Change must come from the inside. Elvis left from Chile on January 1, 2012. He is riding, completely unsupported, around the world for 2 years in an effort to create opportunities for his fellow Tanzanians. Chile to Kili: Driving change from the seat of a bicycle from ConserVentures on Vimeo. Elvis is being the change he wants to see in the world. Mt. lion at Rincón de Guadalupe; click to enlargeCow . . . cow . . . cow . . . two cows . . . cow nose . . . cow tail . . . mountain lion . . . cow . . .
Six of us were crowded around our little Canon G10, using its LCD screen to review the images from the trail camera fixed securely to a nearby oak tree. Out of several hundred photos, the majority showed either cows, the single squirrel that—unbeknownst to us when we placed the camera—lived in the tree on the left side of the frame and indulged itself in repeated self-portraits, or just apparently empty creekside landscape, the result of wind, an overenthusiastic camera sensor, or invisible extraterrestrials—one is never sure. But between the cows and aliens the Bushnell Trophy Cam had recorded a fascinating cross-section of the life in this remote canyon in Mexico’s Sierra Madre. Set amid the sweeping grassland and semi-desert steppe of eastern Mongolia, the Ikh Nart Nature Reserve is a modest (163,000-acre) protected area with a remarkable wildlife population that includes endangered Argali sheep as well as more common but no less dramatic species: Siberian ibex, grey wolf, Eurasian lynx, golden and steppe eagle—not to mention the largest vulture and the smallest hamster in the world. Established in 1996, Ikh Nart, a five-hour drive or train ride southeast of Ulaanbataar, is unfenced, open to visitors year-round, and has no entrance fee or even a headquarters. Travelers can tent on their own or stay in one of a couple of organized ger camps. In part because of this openness, poaching (for both meat and furs) and illegal mining (for amethyst quartz) remain challenging threats for the reserve’s small ranger force, in operation since 2006. Sometimes conservation news seems to come in bunches. Admittedly, it often seems like bunches of bad news, but there are enough good bunches to make the fight worthwhile. In November, 2009, an automatic trail camera monitored by biologists from Sky Island Alliance captured the first known photograph of a live ocelot in Arizona. 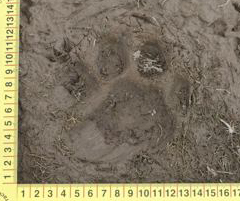 The unmistakable image from Cochise County thrilled everyone with an interest in southern Arizona’s wildlife and habitat—and spurred several churlish comments from the Arizona Game and Fish Department noting that its experts “had not verified the identity of the animal in the photo.” Memo to AZGF: Sour grapes make vinegar, not wine. 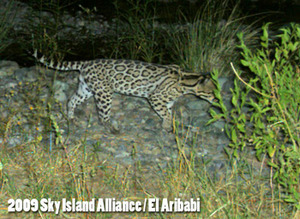 Meanwhile, Sky Island Alliance’s trail cameras had also recorded several resident ocelots on Rancho El Aribabi in Mexico, just 30 miles south of the border (and almost directly south of the Arizona sighting). Early this year, SIA and El Aribabi scored another coup: a video clip of a mother ocelot with a kitten, thus confirming the northernmost known breeding population of ocelots on the continent. This spring brought more good news. Three thousand miles through Tanzania and Kenya: An impeccably prepared and kitted Land Rover 110 300Tdi, loaned to us by Shaw Safaris in Arusha, carried us across a major portion of Tanzania in a quest for three goals: potential safari routes for future trips with guests, new opportunities for ConserVentures to support small, community-based conservation projects, and the delivery of donated equipment to the South Rift Game Scouts. Through a bit of persistence and some nearly unbelievable synchronicity, we succeeded in all three. Apply to win a spot on our Nov. 26-28, 2010 Sonoran Safari to the El Aribabi Conservation Ranch in northern Sonora, Mexico ~ sponsored by Overland Experts. For more information about the trip, click here. The winner will also receive 50% off a one-day training with Overland Experts. All you have tell us about yourself, why you are interested in exploration, and how your participation can help jaguar and ocelot conservation. Enter now, we will announce the winner on October 20, 2010. 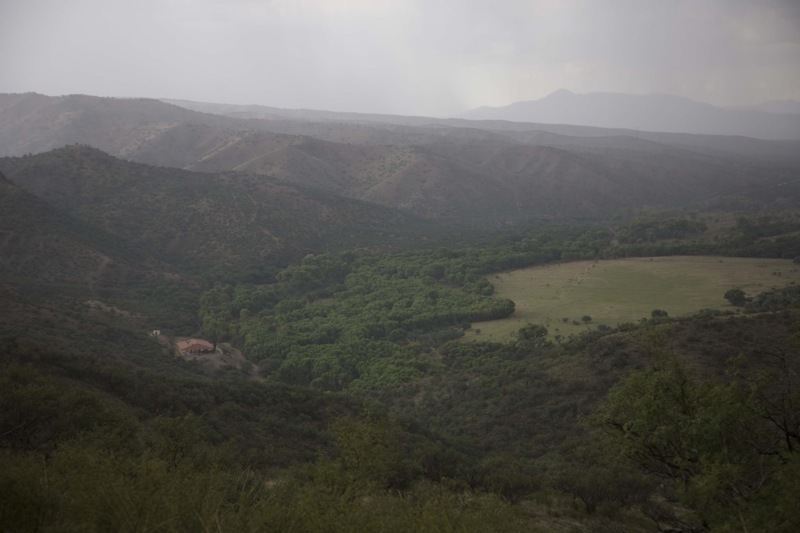 Our Resources for Rangers program kicks off with two Sonoran Safaris in northern Mexico to support jaguar protection. Several slots are still available on the November 26 - 28 safari. Click here to find out more.